World class builders deserve world class coatings. For over 30 years, Jet-Hot has been the leader in high-performance coatings. We've built our reputation by maintaining the highest industry standards, standing behind every coating with a 100% lifetime guarantee. I just got back my exhaust parts back from Jet-Hot and they look great! I previously painted the parts with the best "Hi Temp" paint I could buy—three times, three different brands, none lasted. I got tired of the poor results and I didn't want chrome. After I researched their reputation, galleries, endorsements, and lifetime guarantee... I decided to send them to Jet-Hot. I just wish I would've done it to begin with. 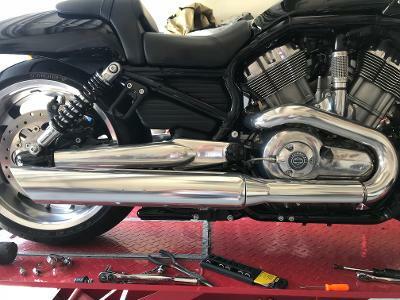 I sent the Magnaflow exhaust out for our Miller Motorsports to get coated by Jet-Hot’s. . .Ultra Extreme Heat 2500 coating. We used this on the headers for KOH with great results so the rest of the system got the treatment before Oklahoma and I’m glad it did. Temps that day were near 100 degrees, so heat soak was more of an issue at this race specifically but the coating performed flawlessly. Our feet, fuel system, and plug wires were all happy and the exhaust still looks new after the event. Keeping exhaust heat down in the confines of an Ultra-4 car has always been a battle so I’m stoked we’ve found the solution. I just received my headers and head-pipes back from Jet-Hot. I just wanted to say that back in 2002, I had a local Las Vegas coating company coat a set of headers and sidepipes for a Shelby Cobra Drag Race Car. They did a very good job, and I was always satisfied with their work. I did wrestle with the thought of having someone local do the job that you provided the estimate for, and I finally decided to ship to Jet-Hot. I wanted to tell you that the coating and polish on the parts that Jet-Hot recently coated are unbelievably nicely done, and I am very happy that I decided to take the time to pack them up and ship them to Jet-Hot. Thank you very much.You made the process much easier than I imagined it would be, and I thank everyone at Jet-Hot for an extremely quick turn-around, and a very fine job done. I will always have Jet-Hot perform all coating jobs in the future. Just received my headers, excellent job guys they are beautiful. Thank you very much. My next set will definitely be coming to y'all. Thank you very much...Great Job. The whole process was trouble-free and the headers look great after the coating. I decided not to paint the headers with high temp paint because it never lasts and before long the headers start to rust. I will do it again on any future projects. Excellent customer service. Fast turnaround. Perfect results. What more could I possibly ask for? get the most performance out of your vehicle. get your parts Jet-Hot coated. click to get a quote today. learn more about ceramic coatings and how to get the most out of your vehicle today.